In a large saucepan over low heat, whisk together milk, half-and-half, eggs and sugar until warm. Add in chocolate chips and unsweetened cocoa and mix until melted. Turn off heat and add in salt and vanilla extract. Place bread cubes in a lightly greased 13 x 9-inch casserole dish and pour chocolate mixture evenly over the bread. Make sure all pieces of bread is covered with the mixture. Cover the dish with plastic wrap and let rest about 30 minutes so the mixture can absorb into the stale bread. Bake bread pudding, uncovered, about 35-40 minutes or until warm. Remove from oven and serve immediately, preferably with a dollop of whipped cream or ice cream. Not sure what to get for your sweetie this Valentine’s Day? Follow the age-old adage: the way to a man’s (or woman’s) heart is through their stomach. 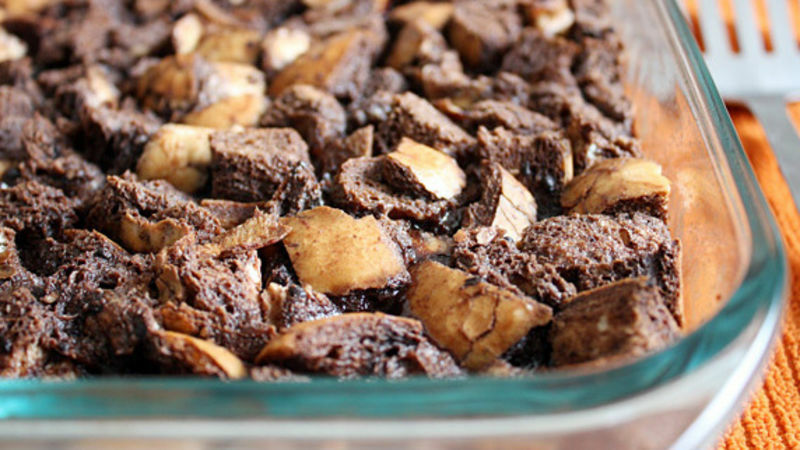 Instead of buying a boring, heart-shaped box of chocolates from the store this year, surprise your loved one with this homemade Chocolate Bread Pudding recipe. I bet he or she will love it – and the best part? There is plenty for both of you to share. When I think of bread pudding, I usually envision a fruit or cinnamon-flavored pudding. This chocolate version is nothing like I’ve ever tried before. It’s a little bit fudgy, a little bit dense and moist, and all delicious. The Dutch-process cocoa mixed with semisweet chocolate chips, melted and poured over bits of yummy bread, tastes almost like a mousse when it comes out of the oven all warm and spongy. And it only takes about an hour of your time so you can spend the rest of it getting ready for your date. Though I made my recipe with a loaf of stale regular white bread, you can use almost any kind of white bread, from baguettes to brioche. Just be sure it’s day-old or stale, or at least leave the bread cubes out overnight to “stale” them up. This ensures the bread pudding doesn’t turn into mush when baked. Place a dollop of homemade whipped cream or a scoop of vanilla bean ice cream on top of this decadent treat, and it’s almost like a grown-up hot fudge sundae. It’ll make the time you spend with your significant other (or your friends, depending on your V-Day plans) that much sweeter.